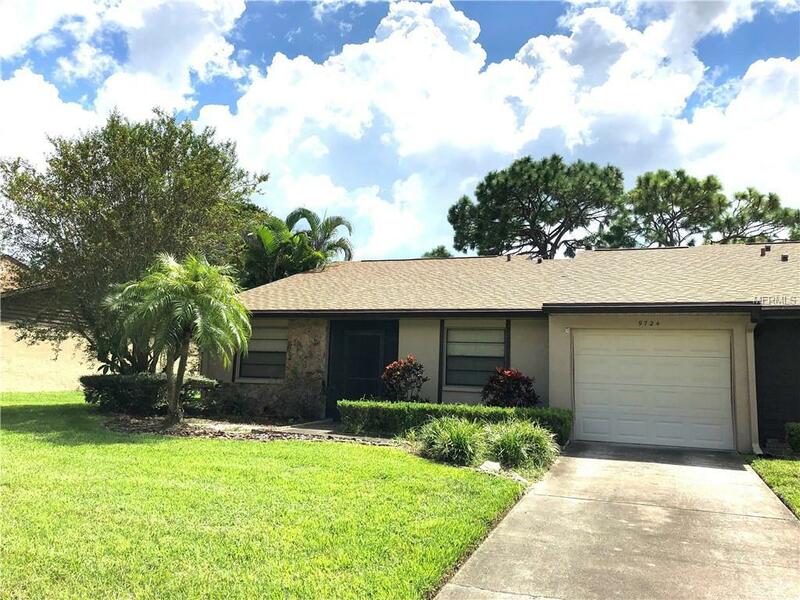 Enjoy this is a lovely 3 bedroom 2 bath end unit villa in the desirable Lake Seminole Village with a tranquil view of the landscaped grounds from the back screened patio! The living space boasts cathedral ceilings with sliding doors that lead to the screened in lanai. The kitchen has its own eat-in space to enjoy your morning coffee or tea. The master suite is over-sized with a vanity area, separate toilet/shower room, and walk-in closet. The 2nd bedroom is spacious with a closet. The 3rd multi-use bedroom can be used for guests, a den, office, media room, nursery, or secluded dining area. The guest bath is centrally located off the hallway along with ample closet storage space. Front door area is screened in to accommodate a caf table and keep you out of the elements. This villa has a one car garage. Walk to the large community pool and club house that's just steps away. The popular Lake Seminole Park's side entrance is easily accessible and terrific for bike riders, runners and those who enjoy walking, picnicking and more. You will be just minutes from shopping, dining, golf, and the Gulf Beaches. Lake Seminole Village was built by Rutenberg Division of U.S. Homes. All owners of property within Lake Seminole Village belong to the Lake Seminole Village Homeowners Association. This is a PUD (Planned Unit Development). You need Homeowners Insurance - not condo insurance. You own the villa and the land - It's yours! New Roof 2016. Respond quickly as this Villa will not last long! Listing provided courtesy of Buffington Prop Mgmt Inc.